Grab this bundle of four resources on the planets and Solar System and SAVE! NOTE: Please make sure you haven't bought any of the items above before purchasing this space bundle. "ALL ABOUT THE PLANETS" is a PowerPoint presentation that can be used to learn about the eight planets of the Solar System. Students learn about the planets the fun way by using this PowerPoint resource. This planets resource can be used as a whole lesson, starting from unlocking vocabulary, discussing key understandings, and assessing students' learning about the planets. 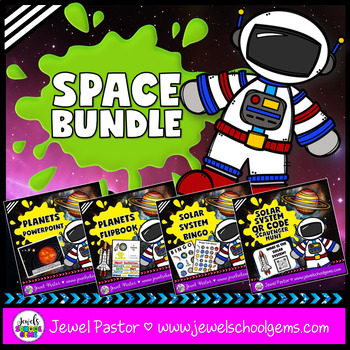 You and your students will surely have a fun time with "All About the Planets". Note: This planets resource is a PowerPoint file. Transitions and animations can be edited, as well as the fonts used. All About the Planets is a 20-page resource that consists of foldables/templates that can be used to create a flipbook on the planets of the Solar System. It can be used to summarize your students' key learnings or understanding of the planets. It can also be used for research work. Pages 9-14 feature the ready-made color templates on the planets. Pages 15-20 feature the ready-made blackline templates on the planets. Page 21 contains the Credits. This 40-page SOLAR SYSTEM BINGO consists of bingo cards, a call sheet and call cards that can be used to study the Solar System. Please see the Preview to have an idea of what is inside this Solar System resource. In search of fun Solar System activities? Engage your students with this fun Solar System QR Code Scavenger Hunt! Print the 15 Solar System QR Code cards on card stock. Make copies of the QR Code Cards questions worksheet (2-sided). Each student will need his or her own copy. Tape the 15 QR Code cards around your classroom where students will be able to find them and scan the QR code with their iPads or tablets. You can put the QR Code cards on the back of your classroom door, on the student desks, on the chalkboard, or wherever you like. Students receive a copy of the Solar System question worksheet. They have to go around the room with their iPads or tablets and scan all the QR Code cards to answer the questions. After they have completed the question sheet, you can go over the answers together with the class. You may want to make this a silent activity so students don't share answers with each other. You can have the kids work alone or with a classmate. Don't be afraid to hide the Solar System QR Code cards in tough places. Students think it's more fun when they have to search around a little. Have a plan for early finishers. You may want to have a task for them to complete when they're done, or you may have them help other students find the answers to the Solar System questions. Note: Images are now hosted in Google Drive. The Public Folder of Dropbox will not be accessible starting September 1, 2017 that's why I have to do the move to Google Drive. Thanks for understanding. Thanks for your interest in my space bundle. Thanks for being a blessing! Thanks to Dancing Crayon Designs for the paint splatter frame, Krista Wallden for the child clip art, and Glitter Meets Glue Designs for the chevron element used on the thumbnail and preview of this resource.